With an increase demand of apartment spaces all across the country, developers have been coming up with unique ways of filling the publics need for new living spaces. The trend of converting buildings that were once used as factories or warehouses into apartments is not particularly new, but has picked up steam all across the country. Parkway Lofts in Bloomfield New Jersey is this type of construction. The site, which was in the midst of construction since 2012, was once a warehouse for General Electric when it was built in 1897. This 6-story building was converted into market rate and affordable housing apartments. Parkway Lofts takes advantage of the buildings great location and views of New York City. Projects like this, while beautiful and filled with history, have been a challenge to developers and design teams due to the unique characteristics of each building. With plans to keep the aesthetics true to the buildings original design, noise control between units very commonly becomes an area of concern. 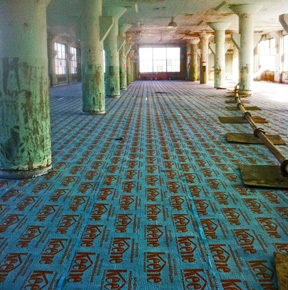 To keep the industrial feel of the building the owners decided to use Keene Building Products, Quiet Qurl 55/025 MC sound mat incorporated into their floor/ceiling assembly to reduce the impact sounds between units. Keene Building Products, Quiet Qurl 55/025 MC is quarter inch entangled net sound mat. It provides the “spring” in the mass-spring-mass floor-ceiling assembly for impact noise control. After an evaluation by the projects acoustical consultant determined that the existing structure could not meet the necessary code requirements, QUIET QURL sound mat was selected for use on top of the existing concrete subfloor. The finish was a four-inch polished concrete topping. Construction at the Parkway Lofts has been completed. One thing that the design and construction team can be proud of is that their future tenants will have the privacy and quiet living space they deserve, while still living in style with modern living amenities.